It won't be long before Nick's entire life is turned upside down, sending him on a frantic journey through a ravaged world that will ultimately lead him 500 feet upwards to a hilltop amusement park. Is it the last safe place on Earth, or are the monsters at the top of the hill even worse than the ones below? The characters seem all a little stupid. For example, the word zombie or 'coming back from the dead' is not mentioned despite all of the blood shed until over half way. Surely the characters would not be so stupid as not to even know what was happening? It would appear in the realm of his book no one had ever read or even heard of a zombie book or film. What three words best describe Nigel Patterson’s performance? Did Ravage inspire you to do anything? 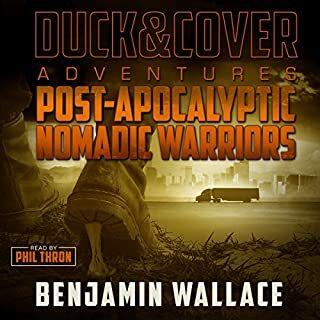 To be honest I'm not sure if I have listened to one to many 'zombie end of the world' stories, and I have had enough, or if this story was just plain old average. The story certainly had the elements to be something great, but compared to some other recent releases it does not rise to the challenge. 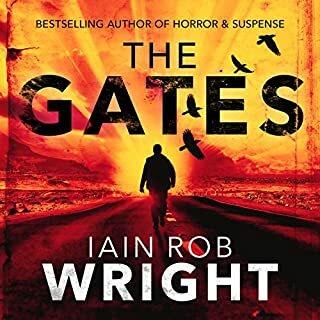 Perhaps I've read one too many of these zombie apocalypse books and have just hit the wall on them, but overall, I found this book frustrating and annoying. I found the main character very hard to engage with from the beginning. I can see that Wright was trying to write a very 'everyman,' unremarkable character for his main protagonist in the first part of the book, but Nick Adams is SO unremarkable, I sort of kept hoping he'd get bitten and die off fast. Also, both he and the main character in the second part of the book keep seeming extraordinarily stupid and doing extraordinarily stupid things just to build artificial tension. All of this seems a bit of a shame since the one good thing about post-apocalyptic zombie novels is that the tension is really built in. You can write really smart, capable characters and still have tension galore. I found the story, on the whole, unoriginal and dreadfully formulaic. The sub-characters were stock and 2 dimensional. Patterson's narration is fine, but not outstanding. Sometimes a really good narrator can rescue a mediocre story and Patterson didn't succeed in doing it. I'm not a zombie fan but I am an end of the world as we know it fan so it takes a lot for me to enjoy a story with zombies in it and this one was easy to enjoy!! I dont think I would of enjoyed it as much if I had read it. Listening to it was better as the narration did a great job and the voice was clear and pleasant. Its was neat the way the narrator did the effects for the voice over the phone and other areas that he made sound real. I got to know the characters in the story and felt like I was there. The zombies, infected as called in the story, weren't so focused on that it took away from the experience of the people like some stories do. This was a fun listen,entertaining all around. *This book was a promotion for an unbiased review. I like the dissolute Ferris Wheel in the background on the cover. The lighting is dark and spooky with a feel of innocence about to be lost. I think it is a nice play on helping visually foreshadow the reader for what is to come. This book is kind of a different take on the usual zombie genre. The sick people remind me of rabid animals before they die and start their zombie afterlife. People just seem to be getting sick with flu like symptoms, then they start going berzerk, then biting and eating others. Iain Rob Wright has the story from the point of view of two people, Nick and Annaliese. There is an error in the synopsis overview though. It says, “Nick’s first customer of the day has just stumbled through the door…” In the story Nick has had a few other customers before the fateful one, not many, but a few. I loved Nigel Patterson’s accent. He really helped bring the story to life. The only issue I had is when the story switched point of views between Nick and another main character named Annaliese. Usually I wouldn’t have any problems with this, but there were a few times Nigel’s voice didn’t really have a tone change between the two to help differentiate when they are speaking to each other. I noticed one scene where he stumbled a little while reading. It was only a slight hesitation, but it is actually the author’s fault for making an error in spelling a name wrong. It is in chapter 15. The name is Charlotte, but the author misspells it to Charlie. If you are reading along it is at page 202. 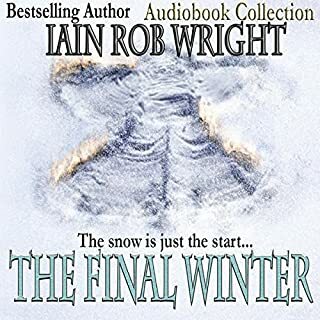 On the audible it is at 5:17:49. I greatly enjoyed this story. I think Iain Rob Wright did a great job of painting out the scenes. The visual details were perfect for me. I am a firm believer that a horror zombie genre should have plenty of gore and blood. This book delivers the gore and more with a dash of senses overload. Warning – Do not read/listen to this story while eating if you have a weak stomach. I loved how you get to feel the anxiety, hopelessness, loneliness, fear, anger, love, and hope from both Nick and Annaliese. Overall, this story leaves you with the idea of knowing that even when one life is over others must live on. Life does not stop just because something bad happens. Those left alive must learn to not only survive, they must live. You never know when life will end. Enjoy it. This is a good Zombie story.A man believes an intruder is in his kitchen.It is actually an infected family member.Once he gets outside he realizes something is wrong with a LOT of people.He is 'rescued' many times by many people.There are enough people in their group to feel sort of safe.No one is safe though.I enjoyed it.I was provided this book by the author,narrator or publisher. 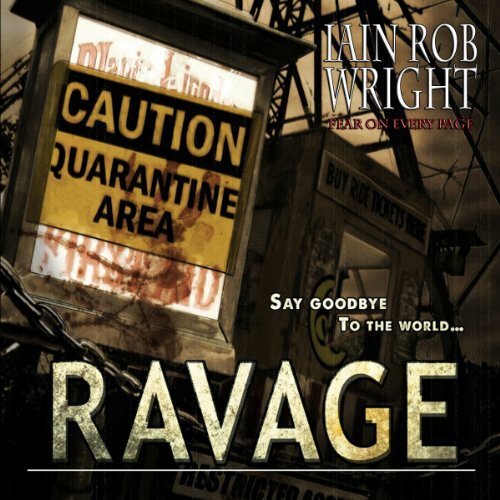 Would you consider the audio edition of Ravage to be better than the print version? Yes, as It was awesome to hear it narrated by Nigel Patterson! What other book might you compare Ravage to and why? 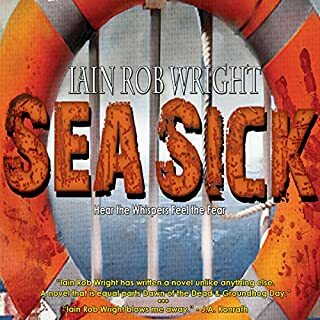 Any one of the rest of Iain Rob Wright books! No, this was my first Audible book and it was an incredible experience to hear the story in a British voice! They were all memorable moments! Nigel Patterson keeps the story moving and his voice is just plain incredible!!! I was in need of some good old fashioned zombies! I really enjoyed this. Ravage was heavy on the gore, which is always a plus. And while there was definite character development, at no time did it slow down the pace of the story. 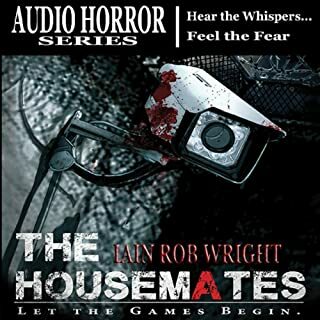 I usually find myself zoning out with British narrators, so I was pleasantly surprised that my interest was held all the way through. My only complaint about narration is that I felt at times Nick's character's voice was a bit too whiny. Great book and worth the money. Pick it up. What disappointed you about Ravage? A lot of things disappointed me. 1. Weak, shallow characters that are massively difficult, if not impossible, to like. In particular I couldn't stand the MC. He was often cowardly, always doing the wrong and stupid thing and was one of the worst in the book for dialogue that made me want to punch myself in the face to forget what he just said. 2. Pop culture changed so characters don't know what a zombie is. This can confuse a reader for a while, given that we know zombie books/films/tv exist, and is somewhat disrespectful to those that created the zombie horror genre in my opinion. If you aren't the first to write something I'm not a fan of you making out that you are. 3. American phrasing from a British writer is pretty poor I think. 4. Some truly painful dialogue in this book. Certainly in the first third of the book, and often when characters talk/think to themselves. Or most of Dash's dialogue, due to author trying to write like a black gang member and just making them out like some horrible cliché. So much of the conversation just doesn't feel natural or believable. Honestly, it was all a little predictable, but it wasn't horrible either. My issue is when writers just repeatedly write characters doing stupid things to get their plot done. If your readers are constantly screaming, "what the hell are you doing?" it's not a good thing. What didn’t you like about Nigel Patterson’s performance? Very little or no major difference in some of his character voicing for one thing. And I'm not sure if he made the dialogue sound worse than it was, or if he was just struggling to make bad dialogue better. Either way I didn't like his reading, and that isn't common for me to really not like a narration this much. Nick. Impossible to cut a MC, but I didn't like him at all. I think the only character I actually liked to any degree was Anna. I'd heard the author was a very good horror writer, and so I was kind of shocked at how bad I found this book to be. It's possible my reaction to the narrator isn't helping me here and if I'd read it myself maybe the dialogue wouldn't have felt as painful in places, but I don't think so. I think it was just really bad in areas. I felt quite let down over this book, though it's not a total waste. Some of the narrative is fine, and some of the story is ok too. However the first third is really bad and many might not get past that point. What made the experience of listening to Ravage the most enjoyable? The charachters are strong and its a brilliant story with many twists. The way things dont always turn out as you would expect. Terror around every corner. Nigel has a really good voice to listern to. 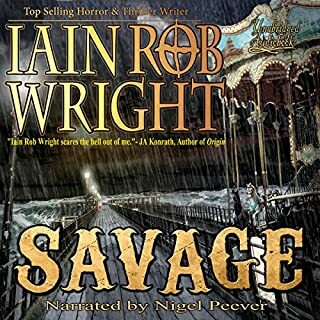 Would you try another book written by Iain Rob Wright or narrated by Nigel Patterson? I found the story quite monotone and there was no excitement flowing, even the twist three quarters through was guessed which let this book down badly. Has Ravage put you off other books in this genre? Yes it has and I will be looking through more and more reviews before being enticed by something promising only to be let down. This book needed more action and battling from the Zombies/Infected, I actually had to listen to this 3 times before the story sunk in more. Too many characters were killed off too soon also as they fell like flies so you couldnt get a grip on them. Extremely disappointed and some anger as the book cover over promises and this book is just a damp blanket when we needed more action. I highly recommend "The Undead" by RR Haywood or "I'm Alive which is set in the USA. Very riveting plots indeed and amazing stories! !